Tuesday 19 March 2019 saw the gathering of various professionals working with separated/separating families in Scotland for an outstanding presentation by the Association of Family and Conciliation Courts (AFCC). 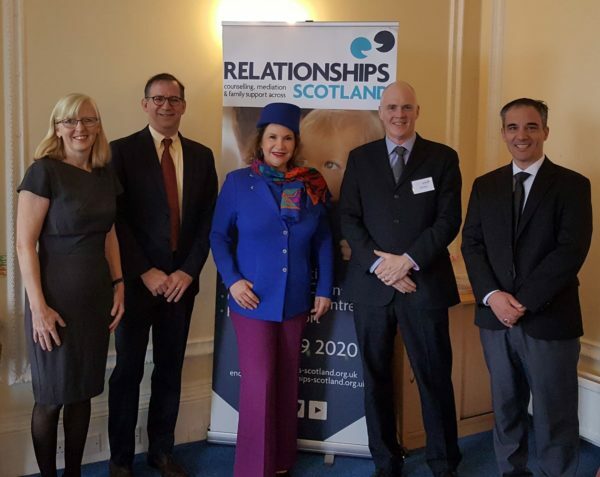 The event was primarily attended by family law solicitors and family mediators but other stakeholders were also represented in the audience, such as representatives from Scottish Government and various third sector organisations. The high calibre presenters included Peter Salem Executive Director of AFCC, Michael Saini Board Director of AFCC and Judge Dianna Gould-Saltman President of AFCC. The topics covered the evolution of family mediation, working collaboratively with high conflict families and incorporating the voice of the child in the Courts’ decision-making. The audience also heard from our Rosanne Cubitt, Head of Practice for Mediation (Relationships Scotland) on the Scottish framework and services available to families through the Relationships Scotland network. The morning was a great opportunity where international experiences, practices and frameworks were shared, with an engaged audience. The Q and A session enabled some very inspirational exchanges of views and practices and it has definitely raised interest amongst the audience members to consider membership of AFCC to enrich their practice and gain oversight of developments and research.